This year, I've played seven major titles which explicitly use loot boxes as part of their in-game economies: Middle-earth: Shadow of War, Mass Effect: Andromeda, Injustice 2, Lawbreakers, Forza Motorsport 7, For Honor, and the Star Wars Battlefront 2 beta. Let's not forget, too, that Destiny 2's Bright Engrams and FIFA 18's Card Packs are essentially the same gimmick wrapped up in passably different clothing. That's seven different genres, all strung up by a gambling-oriented system of microtransactions that, until a few years ago, was relegated to the realm of the free-to-play mobile market. So what's going on? In short, it’s an inevitable evolution of a culture which has dominated the business of the AAA industry for years. After so many episodes of controversy surrounding overt pay-to-win mechanics and shamelessly overpriced microtransactions, the loot box is the publisher's way of dressing up monetisation in more palatable packaging. Try opening a loot box in any of the games I mentioned above, and notice the manner in which the process plays out. The player is encouraged to open the box themselves with the press of a button, as a carefully designed formula of animations and sound effects work their magic to create a great sense of anticipation, before the contents of the package is finally revealed (usually an assortment of pedestrian cosmetic items). It’s a sensory experience that’s specifically designed to entice your attention and whet your appetite, like the eye-catching light show of a pachinko machine, and the whole song and dance implies that the loot box itself is a meaningful and entertaining investment, more than just a needless meta-game expenditure. You’re no longer merely converting real-world cash for in-game cash, but betting on an addictive lotto of luck and potential. Hell, Activision seems to believe that opening loot boxes is such a euphoric experience for its customers, that Call of Duty: WWII will actually reward players for watching others open their own loot boxes. For publishers, then, the loot box is the more easily marketable solution to the public relations nightmare of the microtransaction, but players are already starting to catch on to these tactics. 17 months ago, when Overwatch first arrived on the scene, its use of loot boxes generated a noticeable but relatively mild amount of fuss, as many were willing to forgive Blizzard based on the merits of the game itself. When Middle-earth: Shadow of War released, it arrived to a hostile reception from both press and public alike, after Warner Bros. announced that the game, a largely single-player experience, will feature an online market where players will be able to purchase loot boxes for the chance of obtaining high-level Orcs. That’s right, loot boxes for Orcs. "The more forgiving we are of loot boxes, the further publishers will push to test the limits of how much money they can make from them." Having played and completed Shadow of War, I can safely say that I never visited the market on my own volition once, but that’s not to say it didn’t put a dampener on my experience with the game. During the later stages of the campaign, I could almost sense Shadow of War subtly encouraging me, like the devil on my shoulder, to skip over its endless splurge of nemesis missions and instead build an army by way of of my own wallet. Go on, it whispered, why waste all this time grinding for more followers when you can just invest in some lovely war chests? I didn’t cave, but the very fact that this was a thought process I had to go through left a bitter aftertaste that thoroughly soured my more positive impressions of the game. After paying up to $60 for a AAA blockbuster title like this one, players should never have to find themselves at such a cynical fork in the road, especially as it presents a temptation that deliberately appeals to those more susceptible to gambling or prodigal spending. In fact, the psychology behind the randomised nature of the loot box is a troubling one, especially once you realise it's a form of gambling that's readily available to younger audiences via the friendly face of mainstream video games. Emil Hodzic of The Video Game Addiction Treatment Clinic has even stated that the "randomised system of reward [in gaming] is the one that creates the most addiction", even when those rewards are purely cosmetic. 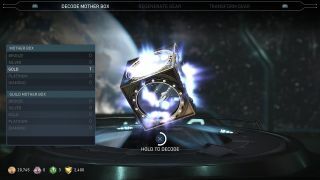 That makes the loot box, which thrives on such a system, a dangerous entry point for potential gambling addiction, but video game regulations have yet to catch up with the potential harm that they can pose. It is here where we can begin to understand why games like Shadow of War, Forza, and all the rest can pose such a problem for the health of this industry. To the detractors who suggest that the loot box ultimately doesn’t affect the quality of a game’s core experience, I can’t say I agree with you. Developers are beginning to design certain elements of their game specifically to accommodate further player expenditure. Take the concept of loot and loot rarity. This was something that was previously a mainstay of the MMO or the RPG; a channel for player expression and progression in an open, often shared environment. Now, we have all sorts of genres offering ‘Legendary Driver Gears’ or ‘Epic Rifle Camos’, and it’s no coincidence that the increased presence of rarity mechanics in games correlates with the proliferation of the loot box. How else can publishers entice players with an unopened chest if the contents lacks any monetary worth? The irony, of course, is that it’s the companies themselves who get to decide the value of an in-game item, and scarcity - as opposed to quality - is almost always the primary determinant of its worth. This awards them a definite level of control over the dynamics of the in-game economy. Even if a game’s loot boxes did have no impact on the gameplay itself, which isn’t true, the existence of such a currency system still represents a problem for the industry at large. The more forgiving we are of loot boxes, the further publishers will push to test the limits of how much money they can make from it. It’s a slippery slope that began with free-to-play mobile titles and has already bled into AAA single-player action-adventure games, and it won’t end there either. The loot box commodifies player progression and defines reward in purely economic terms, and the worst part is that these more sinister motivations are hidden beneath the dangerously attractive window dressing of that shiny, sirenic, unopened chest. All that being said, there is a narrow argument to be made in favour of the increased monetisation for certain types of video games. The concept of 'games as a service' has finally begun to take full fruition with titles like Destiny 2 and Overwatch, the developers of which are offering continually updated, free content to flesh out the breadth and depth of what's available when players log in each time. With the likes of World of Warcraft still going strong on the back of monthly subscriptions, there's certainly a limited place for developers to keep financing their curation of long-term experiences, but the loot box in its current form is far from the ideal means of doing so. It's an uneasy compromise between bringing in money to keep maintaining a popular game, and making sure that game remains balanced and not 'pay to win'. The more optimistic version of myself hopes that current protests against Shadow of War sends a message to Warner Brothers, EA, and others about the increasing dissatisfaction with loot boxes being shoehorned into games that never needed them. Sadly, considering the fact that they’re becoming part of the eco-system, along with season passes, pre-order bonuses, and meaningless microtransactions, I fear that the loot box, at least as we know it, is only going to become more prevalent in future, as it continues to gently poison the way we play.